This engagement cake was made for an engagement party held in May. 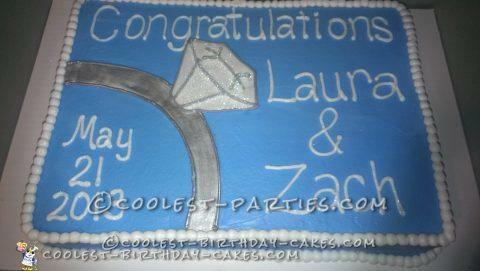 I started off by baking two 11″ x 15″ vanilla cakes and then layering them with vanilla buttercream. I tinted some vanilla buttercream with sky blue and gave the cake a crumb coat. Once that set, I gave it a final coat. Then, once that set, I smoothed it out with a Viva paper towel and fondant smoother. I made a small batch of homemade marshmallow fondant and I rolled it out and cut out the diamond. Then I tinted the rest of the fondant gray with a very small amount of black color and cut the band out of that. 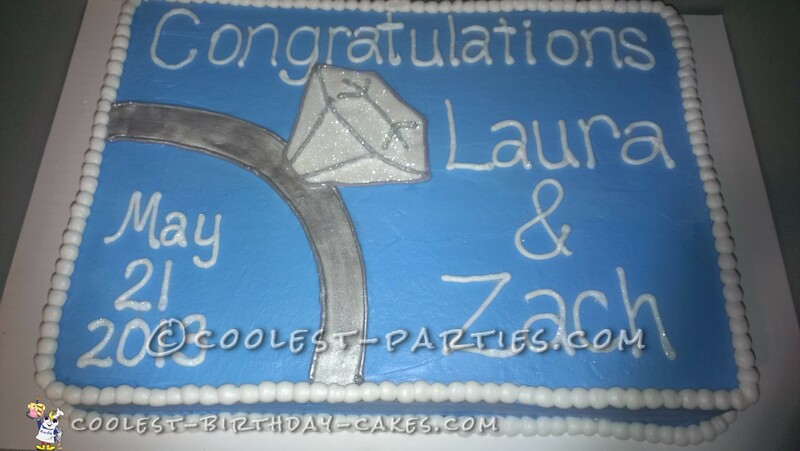 I used some vanilla buttercream tinted gray to make the border of the band and the lines on the diamond. Once that dried, I coated the band with silver luster dust and dusted the diamond with “pixie” disco dust to give it some sparkle. I used vanilla buttercream to pipe the lettering with tip #5 and the border with tip #10. The inside of the ring shows the date the couple got engaged. Finally, I put a little of the disco dust on the lettering for just a little more sparkle!